A few behind-the-scenes photos reveal two major TV show characters meeting that haven't encountered each other in the books — at least not yet, anyways. Spoilers ahead, obviously! Yep, that's Tyrion watching the games with Daenerys and her new husband, as well as Missandei. 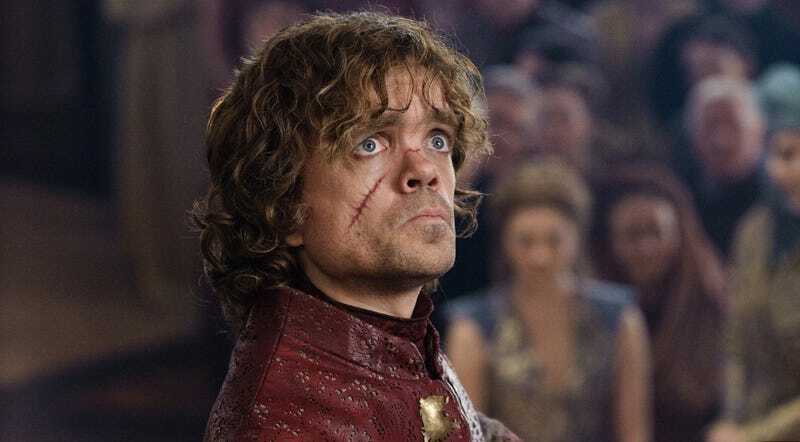 In the books, Tyrion spent a long time just getting to Meereen — a trip which involved being enslaved, masquerading as a performer, and even joining a group of mercenaries — but he and Daenerys have not yet met face-to-face. Seeing the two characters together, and chummy enough that Tyrion gets a spot of honor next to the queen clearly means Game of Thrones isn't going to dawdle in telling Tyrion's journey. Looks like Jorah managed to get entry into the games as well, as although in a much more dangerous way — as a contestant. Theories, anyone? Predictions? Dire warnings?